Bangalore's weather has taken a pleasant turn nowadays. Ideal conditions for cycling. And off late, I have been trying to look around Bangalore. Cycling on the rural roads beats cycling on highways hands down, any day. No horns, great scenery, quite a bit of shade make for really pleasant rides. On Sunday(28th May) we had a really good ride. "We" meaning me, my friend Krishnaprasad(henceforth KP) and an Aussie friend, Wayne Lewis. To introduce my co-riders: KP is a Software Engineer at Phillips. Passionate about cycling. He has done a few long distance rides himself - notably Pune to Kanyakumari and Kanyakumari to Trichy. Cycles regularly, and we ride together regularly. Wayne is Commisioner to India representing the State of Victoria (Australian Govt). Cycling runs in his blood. He is a former bike racer, has won many races, etc. More than anything else, he is remarkably fit. At 55 years of age, he rides fast and makes us "youngsters" huff and puff! The road till Sarjapur is not smooth, but we drove fast. Potholes dominate most segments of the road. [ Caution : My friend Harsha had ridden with me on this road last week on a Hero Hawk and he ended with a rim bend. KP ended up with a rim bend too, inspite of being on an MTB - Hercules AXN DX. ] However, the surroundings are quite pleasant. You get to see a lot of greenery. Traffic is also quite less. The weather was also good and we enjoyed the ride. A few kilometers before Sarjapur, we crossed a road which leads to Varthur. We decided to move onwards towards Sarjapur itself. We stopped at Sarjapur for tea. As usual, a crowd gathered around us and our bikes. For reasons unknown, my Firefox commanded more attention than Wayne's Scott bike. Wayne (he was dressed in cycling shorts and jersey) thoroughly enjoyed the attention and happily snapped a few pics, showing them around to the kids. Just after Sarjapur, we saw a board - "Chikkatirupati - 12 Hoskote - 36" or something similar. We carried on towards Chikkatirupati. The road after Sarjapur is good (few potholes). Best of all, the landscape retained its beauty. We could see dark clouds over our head and I was worried about the rains. Luckily, it didn't rain and the clouds protected us from the sun most of the time. We kept moving at a good place all along, enjoying the road. We stopped for another round of tea at Doddadunsandra. Just as we were leaving the town, we saw three other bike riders surrounded by the locals. We were as amazed to see us as were they. The three guys were french. All of them on MTBs. They live in Whitefield and were going around exploring. We said hi and exchanged some email-ids. We intend to ride together as well. Interestingly, they were using Google Earth to get trails around Bangalore and showed us printouts ! They have created a yahoo group called TheWhitefieldRiders. 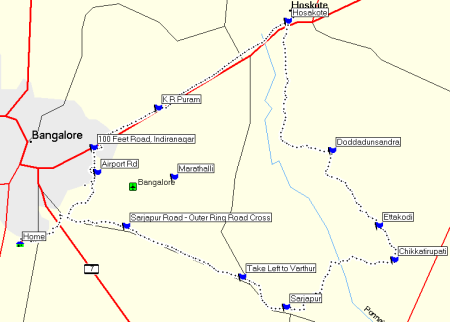 We continued on and reached Hoskote. Searching around for a hotel where we could sit and eat took some time. After breakfast we rode back towards K.R. Puram, where KP bid us bye. All in all, a good, fast ride. Wayne tells me that we did 91 odd-kms in 4 hrs 22 mins of riding time. Scroll the image below to see the altitude profile (meters above sea level) of our ride. As you can see, the altitude variation isn't much - mostly we faced only gentle slopes. That’s cool. The timing seems impressive for the distance. Most of all you must have had a lot of fun enjoying the sceneries along the muddy trails. 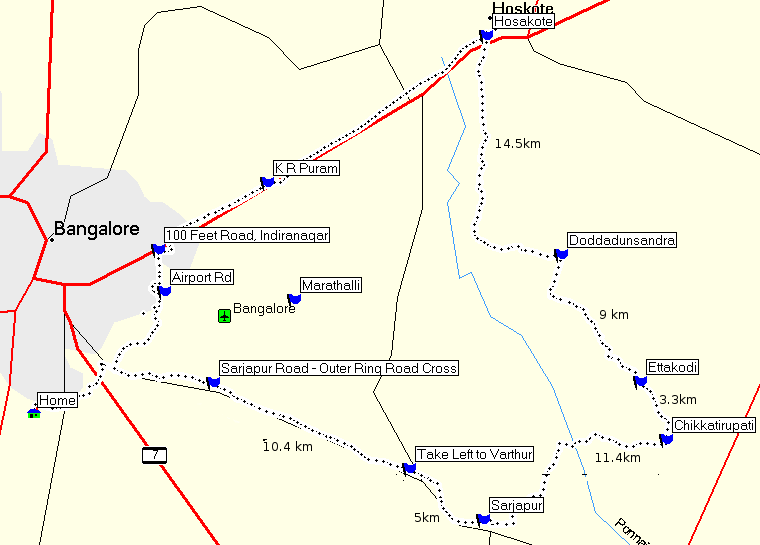 Good one, where can I get a good detailed map of B’lore including Whitefield and Sarjapur? great trip to the north east. the blog was a super idea. thanks for all the info. i am a new convert to cycling, and i chanced upon your page while looking for others like myself. i have undertaken a trip to goa from mumbai via the coastal route and in a few days from today (jan 22) plan to embark on a cycling journey from mangalore to kanyakumari, while trying to keep off the main highways. i do have a sort of a map but it isn’t quite the most accurate. any pointers, in the right direction? Jairaj : Please check your email & contact my friend KP. Here’s wishing you a great trip! I have seen loads oof useful elements on your web site about computers. they are all right, provided you do not mind the tiny screen size. Many thanks for sharing your thinking.